‘Witch and Fox’, used for the Lord God album, ‘The Billionth Record Ever Made’. Conceived originally around an idea of a recycling witch…still on the backburner…either as a great or a rubbish idea…Still, it looked good as a standalone on this cover. A baby bird tugs on a juicy worm. 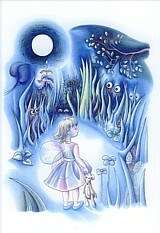 I like the way the little girl is unafraid of what lies in the strange undergrowth. A mouse chases a ball….